Here's a new feature that's been at the top of the list for a long time. And a big handful of other, important fixes I'm releasing this here in the Preview Center for now, and am hoping to release a final/public build in about 2 weeks. NOTE: This is not available via the built-in updater. You must download this ZIP and double-click the installer EXE inside. The installer is digitally signed and Windows' UAC dialog will display the publisher as dotPDN LLC. Many thanks for the update - downloading now . Edit: Just noticed that, doing it this way, one will lose previously saved Effects. Great way to clean them out . This install shouldn't affect your installed effects. When I installed it, I thought the same thing. But, I went into the Effects folder and right clicked on the missing effect's DLL files and "unblocked" the individual files, everything showed up fine. I guess you must have done the 'unblocked' prior to install? I didn't and it installed sans all of my previous effects. Edit: I went back and unblocked the missing DLL files and they are now showing up - Many thanks @BoltBait for that tip . Love, love, love the 'overscroll'!! I don't know how many times over the years I've wished I could scroll "just...a...little...bit.....further....." when working on a project. This is a great new feature. 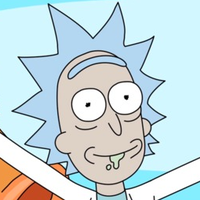 Thank you, Rick! Need to play with it some more...but after work. Why are the dlls blocked? They were never blocked with previous updates. When you download DLL files from the Internet using IE, they are blocked by default. 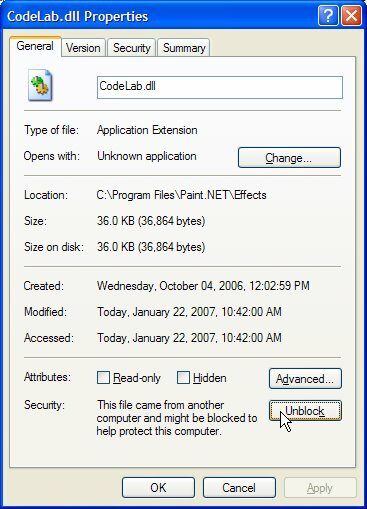 You need to unblock the DLL files for paint.net to use them. I may be wrong, but I think that because this zip download is essentially a "test" version, that's why it didn't copy our effects over. Perhaps, when it is launched, in two weeks time by the regular method, then it will save the effects from the older version. But .............. this is just my guess . I never use IE. I have always used Chrome to navigate or download the dlls. Could it be that the new update is doing something to block the dlls? As I said before, I never had this issue with previous updates. Anyway, I guess I will have to unblock my 600+ dlls one by one. Thanks BoltBait. Just wondering why CodeLab v2.12 does not appear in the list of plugins. ...CodeLab v2.12 does not appear in the list of plugins. Time to update your CodeLab plugin! Some important plugins are still not showing up for me despite unblocking them. Curves+, Vibrance and Random Shape Fill are still not showing up and if I unblock them, their DLLs somehow need to be re-unblocked over and over as if unblocking them cannot be persistent. Any help with this? These are very important effects to me. ...if I unblock them, their DLLs somehow need to be re-unblocked over and over as if unblocking them cannot be persistent. I have never seen this behavior before. Could it be an overzealous virus scanner? Make sure the both Effects folder and the dll file are not set to Read-only. Yes, they are on the Effects folder and its is not set to read only. I guess I will have to find DLLs of those effects that are not blocked by default or try to unblock them using my other operating system cause I'm on a multiboot computer. I did manage to save Clouds Effects and Shape 3D using the unblock method though. I think I have to find a way to "take ownership" of the DLLs. Some of them date back to 2012 because they were copied from my old computer. I'd still like to see these two units linked. If I select inches in the status bar as my base unit I'd expect to see the same unit used for Rectangle Select > Fixed Size. I had to download a take ownership.reg file so that "Take Ownership" appears on my context menu for files. I would use the Take Ownership function every time before unblocking the DLLs and that worked! They now appear with this Paint.NET beta version. I thought something was gonna hold me back from updating. I can report that after unblocking 'Psychocolour' the double slider up/down arrows now work as expected! - Excellent bug squashing, many thanks. The unblocking issue for Effects and Filetype .dlls is a pain but the 'over-scrolling' feature is great. Plugins weren't supposed to get "blocked" like that.